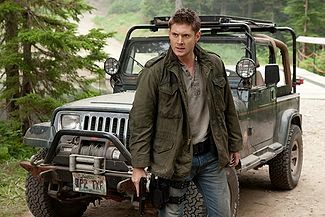 Future Dean represents Dean Winchester five years into the future of 2009. During his era in 2014, demons have released the Croatoan virus which has reached and affected a great portion of the human population, turning the infected into mindless, murderous zombies. During this time, Dean is in command of a resistance force at Camp Chitaqua, where survivors have gathered including Future Chuck and Future Castiel. The Future Dean never reconciled with Sam after they parted, and at some point Sam agreed to be Lucifer's vessel in Detroit. Future Dean tried to become Michael's Vessel, but it was too late as all the Angels had given up and returned to Heaven. When Dean from 2009 arrives at Camp Chitaqua, Future Dean takes him prisoner. Dean finds that Future Dean has become ruthless, resorting to torture to get information. After regaining the Colt, Future Dean leads a mission to kill Lucifer, using his friends in a suicide mission to distract Lucifer, even knocking out his past self to stop him protesting. In a confrontation with Lucifer, Future Dean is killed. There was mixed opinion amongst fans as to whether the future shown here is "real" or merely constructed by Zachariah to persuade Dean to become Michael's vessel. In the commentary to the episode on the Season 5 DVD, Eric Kripke and Ben Edlund describe how initially the episode was going to involve time travel, including Future!Dean expressing awareness of his other self's true nature as he discussed remembering these events from present Dean's point of view, but the premise became so complicated (they describe drawing it on a whiteboard to explain to Bob Singer who retorted - "You going to do that for the viewers?") that they changed it to an alternate universe model. This page was last edited on 14 November 2014, at 17:42.